Acid (hydrochloric acid, vitriol, phosphate, chromate), Alkali (Sodium hydroxide, Potassium hydroxide, autunite hydroxide, ammonia, sodium carbonate), Inorganic salt ( sulfureted sodium, Niter, Glauber's salt).Chlorin impregnant (tetrachloride, chloroform, chloridize ethane, chloridize methylene),Aromaticity(Benzene,cycloparaffin,enol).Ketone(Acetone, butyltone).Alcohol(alcohol, carbinol),oil(gas, coal oil, alkalescence water-solubility cutting liquid),Ester,Aether,Amine,Screw encapsulant,seawater. 2\In order to avoid too much pressure fall, the outlet pressure should be controlled lower than 85% of inlet. 3\If the air flow is not enough, the lubricator will not drop the oil. So the air flow of the lubricator must be satisfied for the oil drop requirement. 4\The oil of the lubricator must be Turbine No.1 Oil ISOVG32.The components will be destroyed if you use another kind of oil. 1\Before use, heck the unit to see if it is damaged during the course of transport, and if the joint part is loose. Hen install for use. 2\When installing, ay attention to the direction of airflow and keep the unit upright. 3\When the inlet and outlet belts are in reduced connection, he flow rate of the unit is reduced by 10% approx. With each upgraded class of filtering precision, the rate of flow will be reduced by 7% approx. 4\For units with a protective cover, make sure such cover is fixed before use to avoid danger. 5\When use the pressure reduction valve or filter pressure reduction valve, it is required to adjust the control hand wheel to the zero position first. Fix the pressure gage and end plug on the corresponding positions of the pressure reduction valve or filter pressure reduction valve and ensure they are air-tight(positions of the pressure gage and end plug may be exchanged)Then let in air and adjust to a proper pressure. 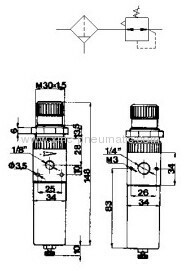 6\When using the oil mister, it is required to adjust the oil quantity valve needle to the zero position and add appropriate oil to the oil level line first. Then adjust to a proper position after letting in required air. Pay attention to the brand and grade of the lubricating oil. Never use spindle oil and lubricating oil containing lower ketone or aromatic hydrocarbon. 7\When using metal tubes for connection, remember to remove the metal grains, dusts and oil stains in the tubes.